Seitenbacher is an all natural food manufacturer located in south Germany, founded by Willi Pfannenschwarz in 1980.His bestseller was a mix of whole grains, dried fruits, nuts and seeds known as Müsli. Today’s food is heavily processed, many food manufacturers use preservatives, artificial ingredients and other unnatural components. Seitenbacher believes that natural grown ingredients are perfect the way they are, that is why we simply clean and package them to ensure a 100% natural product. The result is a delicious and nutritious breakfast alternative that takes almost no time to prepare, just add some milk or yogurt (or whatever your prefer). 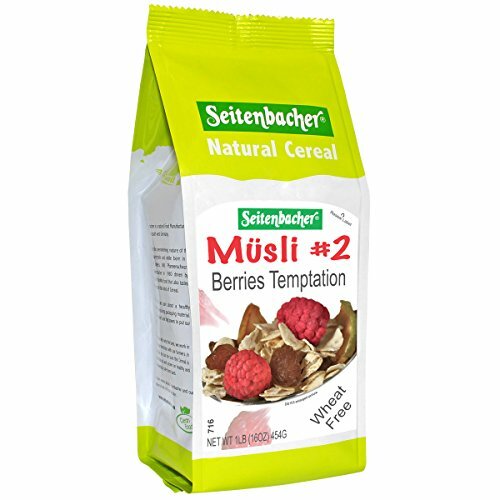 Seitenbacher Muesli is the perfect breakfast for anybody who has a busy morning routine and lives a healthy lifestyle. Muesli Berries Temptation is packed with whole grain oats, whole grain barley, almonds, raspberries and raisins for sweetness. If you have any questions about this product by Seitenbacher, contact us by completing and submitting the form below. If you are looking for a specif part number, please include it with your message.